Hey there and welcome to he last June challenge at Paper Issues! 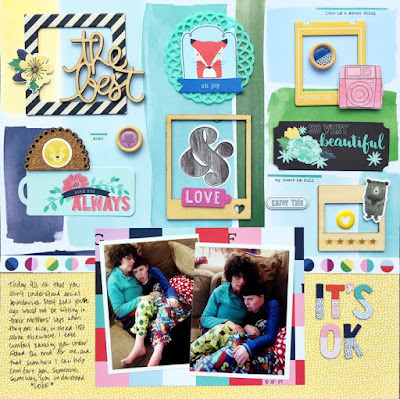 It's another Product Spotlight and today we are focusing on ToyBox by Carta Bella. Talk about fun. It's vintage, but it's bright and colorful. 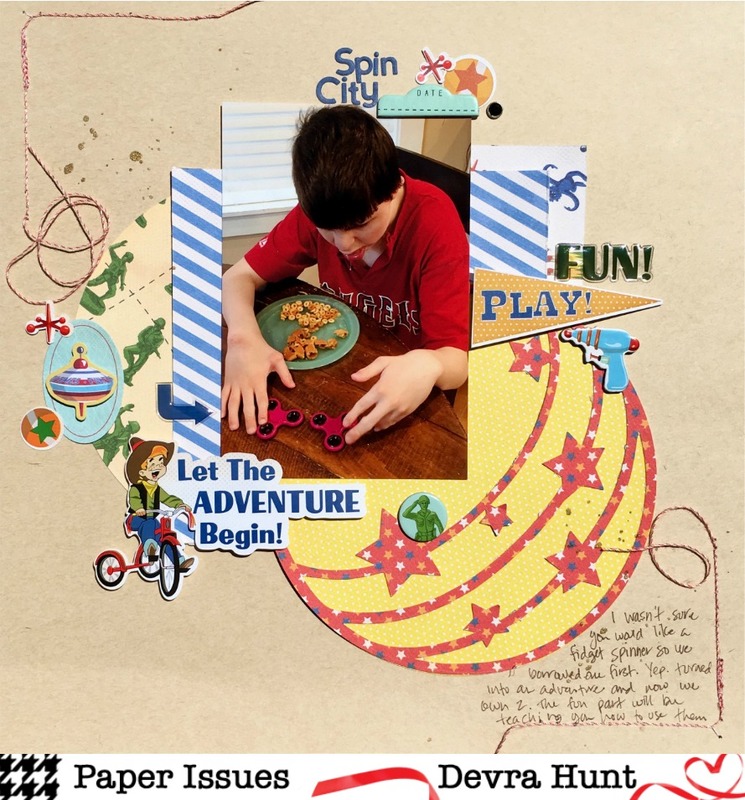 A perfect combination to create pages about kids playing. 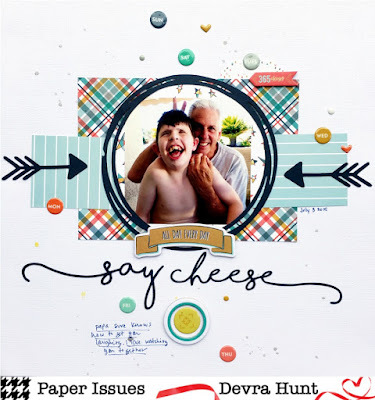 The B ideas of the papers are fantastic basic prints in primary colors that are so versatile for any kinds of projects. Today I used it for a toy themed page. I started with the Toy Time free cut file where I used the B-sides of the This Way Men and No More Monkeys papers. After that, I used the Toys Everywhere stuck a few of the scraps behind the photo. I scattered all types of the embellishments around the page. Lastly, I played with some stitching on my Stitch happy sewing machine. I love the red twine thread! As always, thanks so much for being here today as I share my creative view. Well, I have to tell you, you need this collection. ToyBox is so much fun. I already have 3 other pages planned for it! You can get it for 20% off when you use my code DEVRA at checkout. Oh good morning! I love Sundays! Especially in summer. 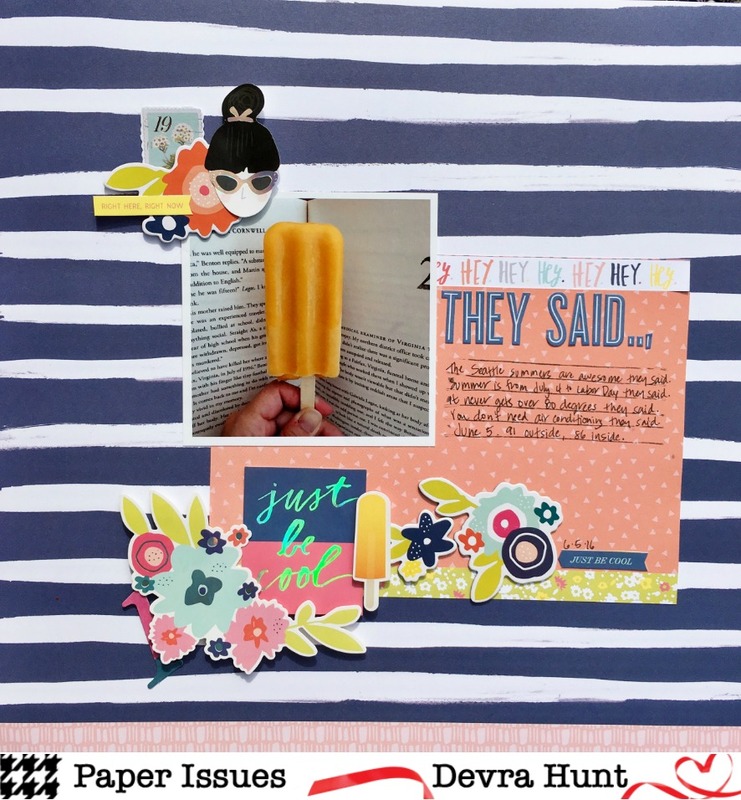 Well, also because it Scraplift Sunday at Paper Issues. Today we lifted a lovely layout by Amanda. Here is what I did with it. Yep. It's pretty much the same. I took some liberty with the title placement, but I liked it the way it was. I had to laugh a little as I was using Summer Dreams by Echo Park. It's really a very girly leaning collection. Why? 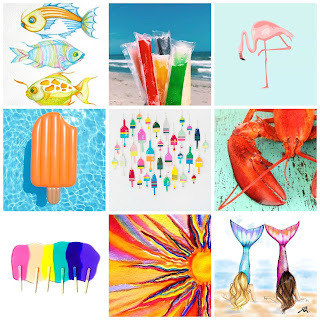 Who knows, but summer colors are summer colors, and summer icons are summer icons. They all made it onto this page! 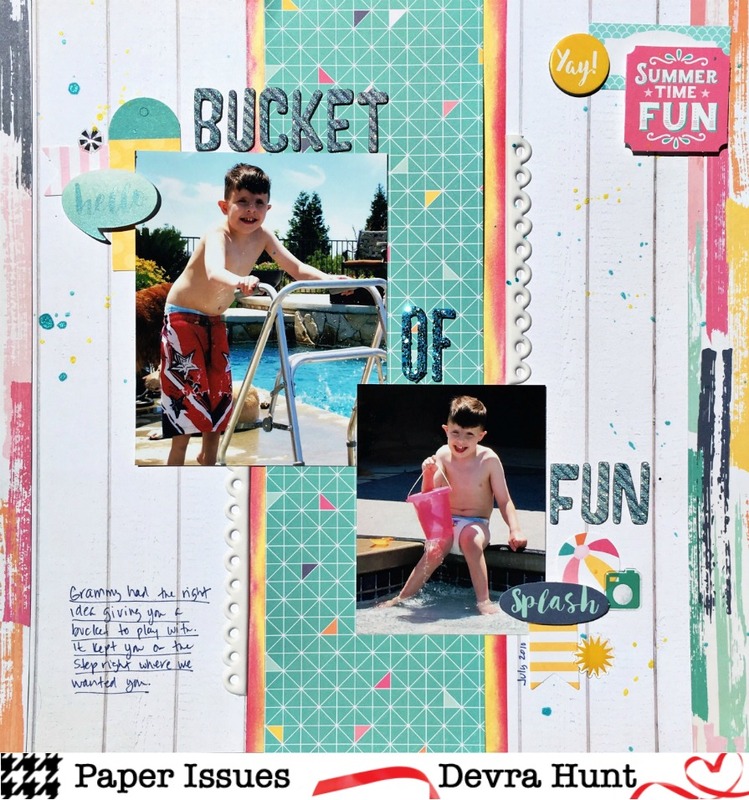 Stickers, die cuts, enamel pieces and chipboard all add to the delightfully summeriness on this page. For several years, we would make the long drive to my Dad's house. The backyard and pool are so inviting. My son loves being out there with everyone. Sometimes he likes the pool, sometimes not. This was definitely a day where he liked the pool. Especially the bucket with the holes in the bottom from Grammy. What's more fun that filling a bucket and watching al the water spill out so you can so it again? Thanks so much for stopping by my creative view today. Hey over to the shop, get some Summer Dreams or other new goodies for yourself. Use code DEVRA for 20% off your purchase! 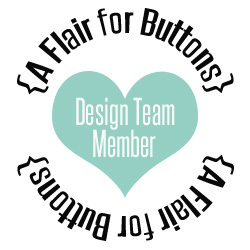 Join our Facebook group for fun ideas and lots of challenges! Happy Friday to you! 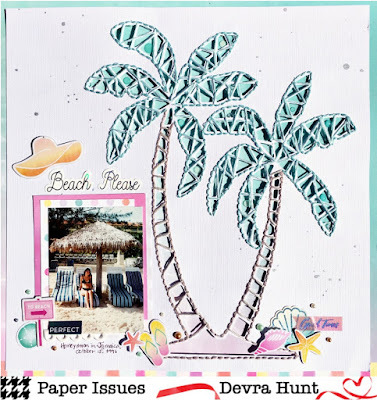 It's Free File Friday at Paper Issues and today's theme revolves around summer! 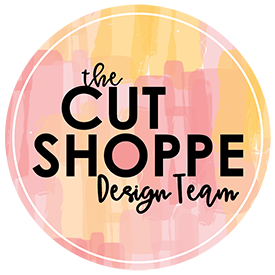 There are so many great summer cut files in the shop right now and the best part is they are all FREE! 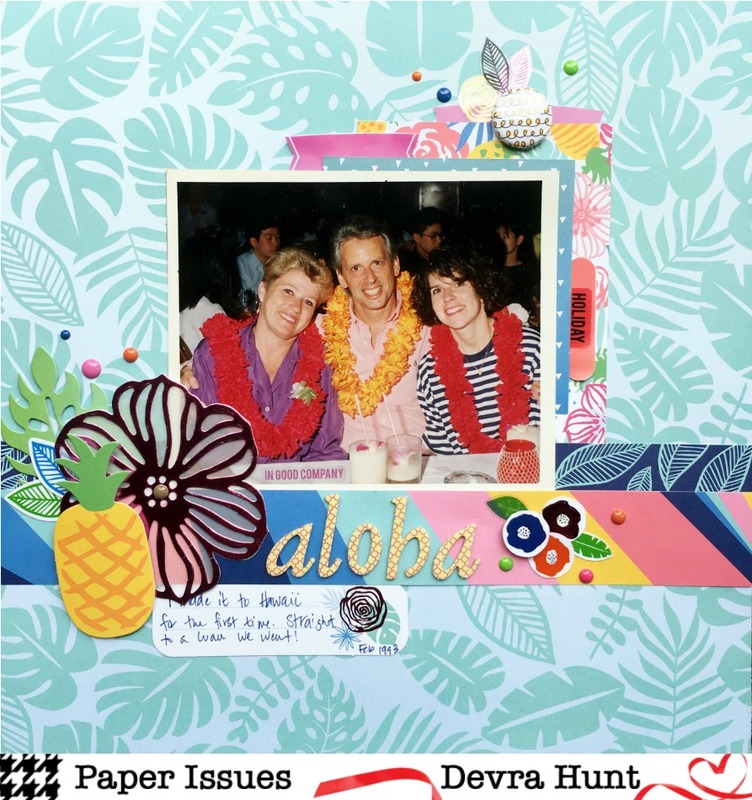 Today I used the Geo Tropical Palm Tree cut file as the main focus of my page today. I really don't know what I was thinking. I got the idea in my head to sew around the edge of the trees, then sew over the geo cut outs across all the leaves. It was extremely tedious, with some bumps along the way, but definitely worth it. 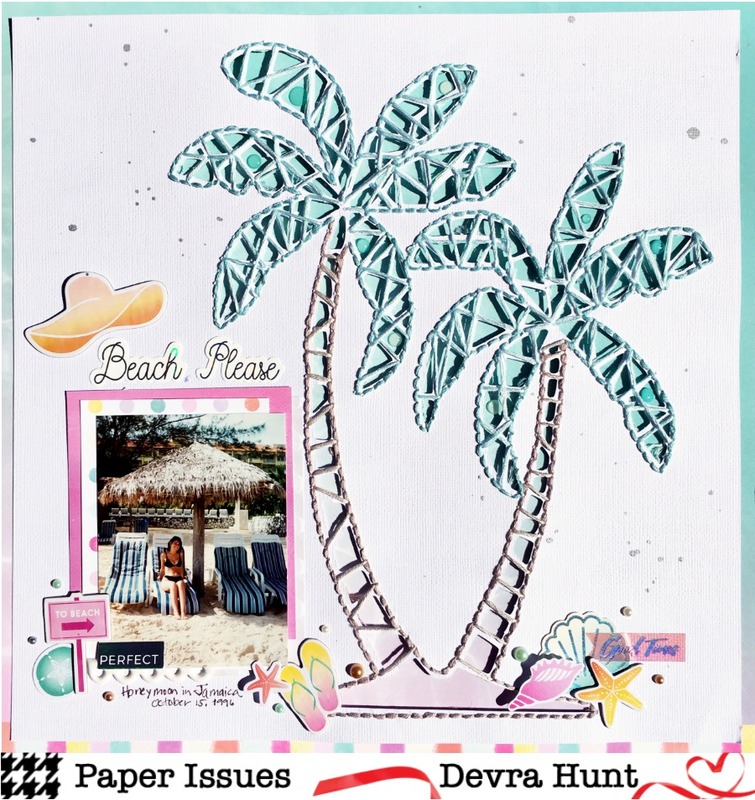 I backed the trees with the water side of Summer Lights Paper #9 The ombre is perfect and I love the end result. The rest of the page is filled with paper and bits of Pink Paislee Summer Lights that I couldn't wait to use! I mean all the die cut, sticker and chipboard seashells couldn't have been more perfect to lay across the bottom of the tress! I've had some fun lately digging into older photos. I found several photos from my honeymoon to play with and this one fit the bill for this page. It was our last day in Jamaica, and I was just enjoying some time staring at the ocean. Thanks so much for stopping by my creative view today. I hope you find some inspiration from my page today. 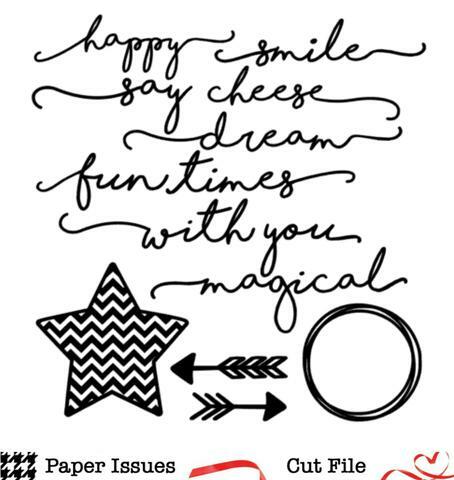 I love my electronic die cut machine and also the colors in the Summer Lights collection. You might too. Head over to the Paper Issues shop to pick some up for yourself. Use my code DEVRA at checkout for 20% off your purchase. Hey there friends! It's Swag Bag time at Paper Issues! Don't know what a Swag Bag is? Well you should? It's our version of a kit, but it's pint sized and filled with little bits of heavenly, scrappy goodness. If you like to mix and match, this is just he right item for you. You can buy it monthly, or purchase a 6 month subscription. The best part about it, for me is, I can pull pieces from several months and still put a fantastic project together. For my pages here today, I used several pieces from the May Swag Bag, adding a few embellishments from the Feb kit as well. See what I mean? I stuck to a color theme for this page, which is another thing I love about the bags. There is always a theme, or two in the kit! the last thing I'll say for today is that Swag Bags make it so easy for me to strap. It's all done for me. the paper choosing and cutting is already done for me. I just have to decide how to use it! I went with a simple shelf design today, cutting a few papers in half to create symmetry, then placing more papers behind the scallop but file . It's a subtle addition of color, as well as a place for the photo to rest. I finished this off with a great title and background papers. Finished in less than an hour! Hello there! 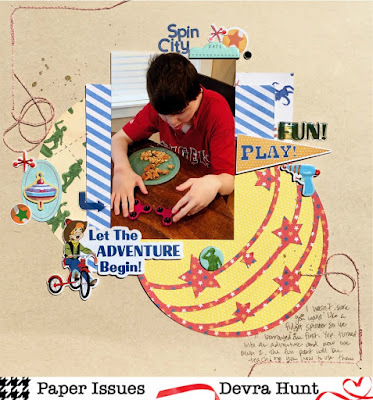 I'm so happy to be sharing this page today for the Learning Spaces article at Get It Scrapped. Homeschooling and creative spaces for children are on the rise. We used the idea of learning spaces as inspiration for the design of our pages. I was drawn to the use of neutrals with color. The other thing I noticed was walls were filled with a hodgepodge of items. I took the idea of the walls in the rooms as the main idea of my page. First, the paper I chose is paint brush strokes, like a child's work of art. I placed several different types of frames on the paper, filling them with a variety of embellishments that pertained to my story. The result is an organized variety of shape, color and texture to engage the senses, and the viewer. My son was so sick he wouldn't leave my side for two days. Most 14 year olds wouldn't be caught cuddling with Mom. I decided that I was ok with him not realizing this social normalcy for someone his age. I took comfort knowing that he knew he needed me. Hey there and good morning! 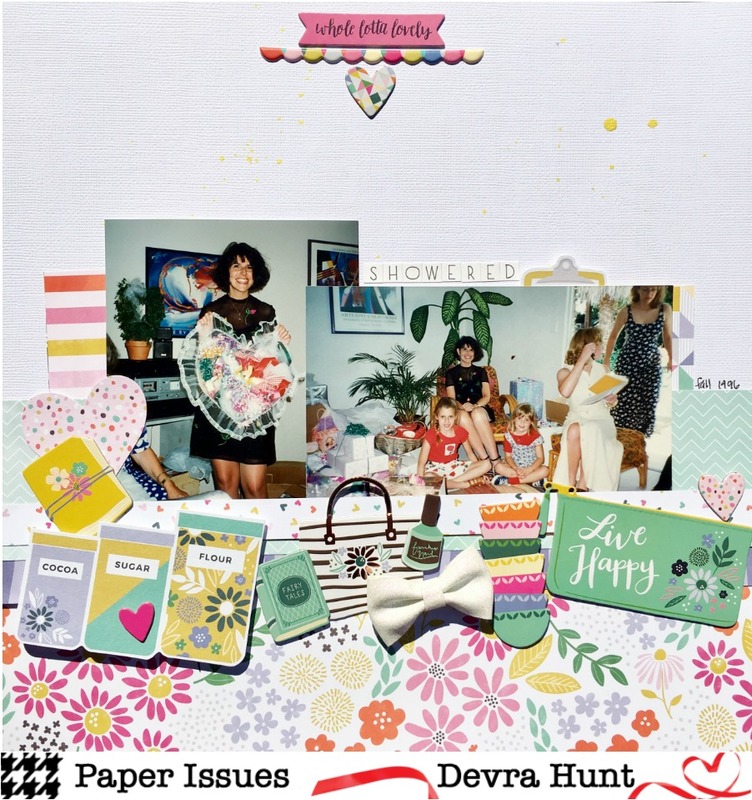 Today at Paper Issues, we are kicking off part two of our June Issue Friends-Aversary. This is such a great theme for an Issue, but what does it reall mean? Let me give you some ideas to get you started. Suggested ideas: There's always a reason to celebrate, so create a project about friendship, wedding, anniversaries, birthdays and more or make a page about your best friend. There are a number of pages I could do for this theme! Knowing that my page would come later in the month, I had time to think about my topic. My first thought was to do something from my birthday, which was right before the deadline. I stuck to that general idea. I narrowed down my choices of photos, then started looking through my stash and cut files. This kinda came together that way. A photo of my fiends and I at my birthday party. My Tribe for sure. I went with PinkFresh Studios Live more and the Your Vibe Attracts your Tribe cut file, which became the title of my page. I honestly couldn't decide what tone I wanted this page to have, serious or silly, so it has a bit of both. I may have to do this page again, so I can show our other side! It took a long time, but I have made wonderful friends here. These ladies are my tribe. Or My Squad as my husband calls us. I do not know what I would do without them, and hope I don't have to find out! We eat have our own stuff going on, but somehow we manage to be there for each other, no matter what. Thanks so much for stopping by my creative view today. I have so much going on the next few weeks, I hope you'll come back often. In the mean time, stop by the Paper Issue shop and stock up on all the new goodies that have come in this past week. Pink Paislee Summer Lights, Simple Stories and Pebbles Girl Squad to name just a few. Use my code DEVRA at checkout to receive 20% off your purchase. Good morning! 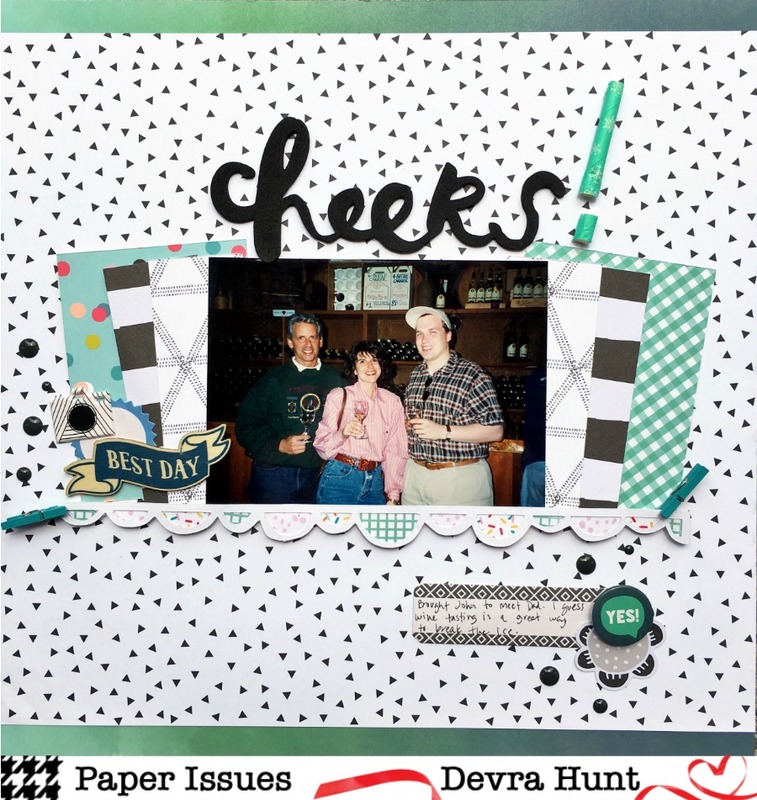 Sundays are for Scraplifting at Paper Issues and I chose a fun one for you today from Anna. I liked her design. It's refreshing. I put my own spin on it by pulling the papers into the center for two reason. Onc, I used my new Stitch Happy swing machine around the edge of the paper. Second, the MME Hey Mister tool chipboard and die cut pieces are rather large. I needed more space to be able to use them. When I was about 9, my Dad bought my sister and I a tool kit. It was in a wood box, and all the tools inside had wood handles, the edges painted blue. He taught us how to use every tool in that box, including how to use a saw on a horse. He said we should know how to use tools and how to fix or make basic things with them. When I moved into an apartment. he bought me that electric drill. One of my nicknames around my house is Tool Time Tina, because I am not afraid to tackle a problem on my own. The toy in the photo is something I made for my son. I fashioned it after something he has at school that he loves. I now have one happy kid. So, thanks Dad. Thanks so much for stopping by my creative view today. You can get some MME Hey Mister in the Paper Issues shop. It's perfect for those masculine topics. Use my code DEVRA at checkout for 20% off your purchase. I hope to see you playing along with us! Hello! 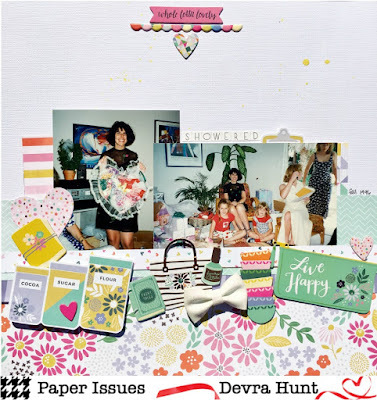 It's Pinspire Me day at Paper Issues and oh my goodness this months mood board is Ah-Mazing! Just look at those colors! I love everything about this. Well, I love summer, so of course I would. I stared and stared trying to decide which direction to go in. Paint? Beach? Pool? At the very last minute, I settled on this. The popsicle. It really inspired the story behind the photo. Because of that, didn't want to use a summer themed collection, but I wanted to use color. So, Dear Lizzy Lovely day fit the bill. Color, plus sentiments I could use in a funny way from the stickers and ephemera. I think I'm in a navy phase. It seems fresh to me. So I used the B side of the Bunny Love paper for the background. I kept this really simple so the title and story could be seen. But really, without this mood board, I probably wouldn't have done this page. This photo came up in the 'On this Day' reminder in my Facebook feed. I'd forgotten al about it. But yes, everything I wrote that day is true. I took every word and used that as my journaling. So popsicles. They aren't just for kids anymore. Thanks so much for stopping by my creative view today! I hope you all love this mood board as much as I do. 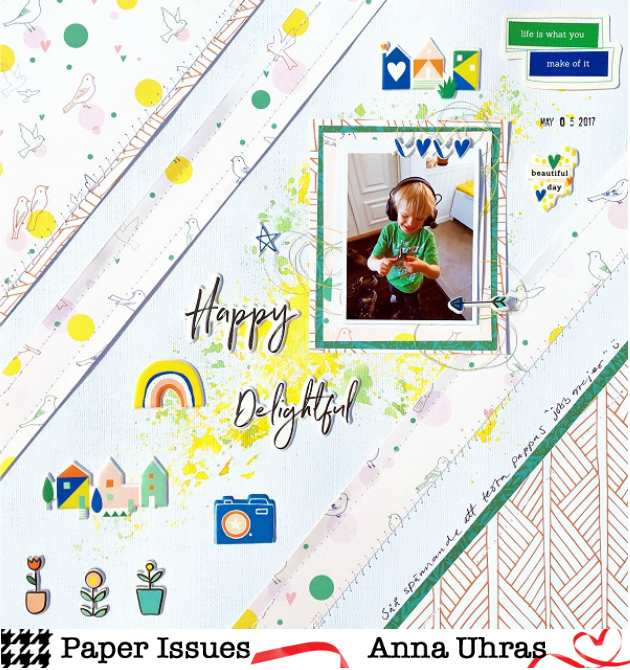 I also hope that when you shop at Paper Issues, you'll use my code DEVRA at checkout so you can get 20% off your purchase. There's so much new stuff! you really should go look! Good morning! 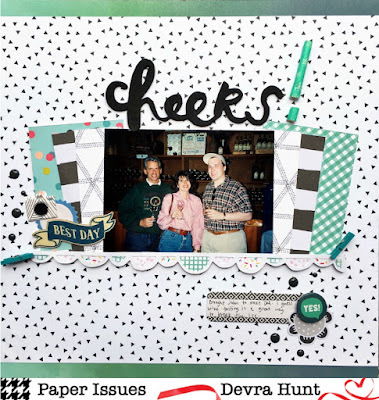 I'm on the Paper Issues blog today for Scraplift Sunday. This is one of my favorite challenges. Why? I love other people's creativity. I also love that it's easy! The design is already there. I grabbed an older photo today because I've been dying to use the tropical side of Amy Tangerine On a Whim, It was fun to use a bolder background! I actually used both sides of the Ray of Light paper, as the background and one of the paper strips . I told myself I would find a way to use the giant flower in the ephemera pack and I did! I tucked a few more bits and pieces around the page and called it done. Easy peasy! This was my first visit to Hawaii. What does one do in Hawaii? 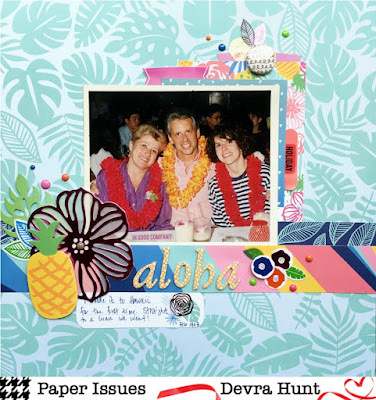 Go to a Luau! I was excited to be there and spend time with family. Thanks so much for stopping by my creative view today. 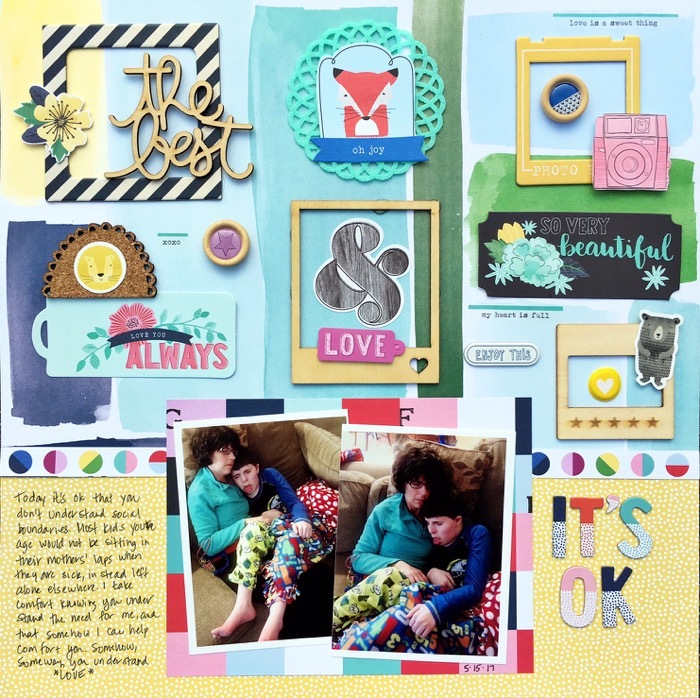 Check out the Paper Issues blog to see the original LO and more examples from the team. 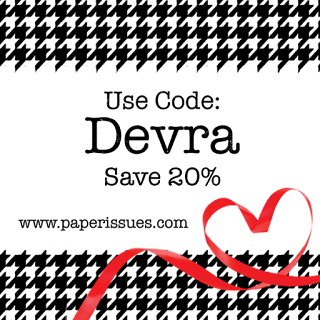 Then join us in our Facebook group to share what you made! Hello there! I feel I have been neglecting my blog this past week. I'm afraid real life had to come before crafting last week. 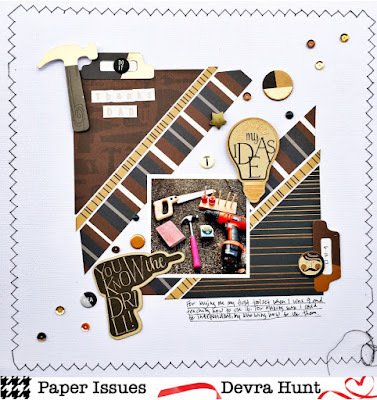 Never fear, I am back today with a layout I created for Free File Friday at Paper Issues. The theme this week is to use any free file in the shop on a project featuring the men in our lives. Well, I love our cut files. I can always find one that works with my ideas. Like today. I love this photo. It makes me smile. I scanned my library, finding the Magical cut file. The 'smile' was bit obvious, so I skipped over it. The 'say cheese', perfect. I also cut a couple of arrows point towards that photo that is so beautifully framed in the circle. I went digging into my stash for some scraps of Fancy Pants Family & Co. I slipped a few papers behind the photo, scattered some embellishments and called it a day. the cut files and photo are really the star of the page. Theres nothing better than watching my Dad being Grandpa. He finds ways to play and engage, and always makes him laugh. Now if only we lived closer so we could see each other more often. Thanks so much for stopping by my creative view today. I hope to see you playing along with our challenges this month. There are so many to choose from. You can find them in our Facebook Group. Remember, you can find our free files in the shop along with so much more. You always get 20% off your purchases when you use my code DEVRA at checkout. Hey there and Happy June! 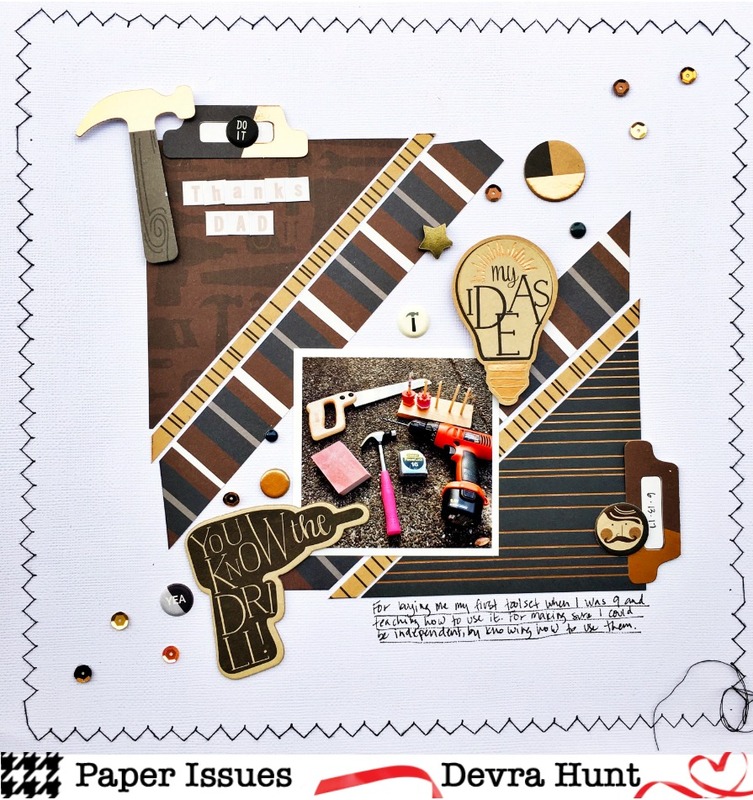 I'm starting the month off by joining the Working Title challenge at Paper Issues. This month our titles are "one little word'. Yep, one word, and it needs to be little. Ive been digging through old photos lately. I stumbled on a group from my bridal shower. That led me to the title, "showered' and then the products. I decided on Pink Paislee (PTE) Oh My Heart. Why? Because of the eclectic mix of motifs! I never in a million years thought I'd use the bowls, the sugar canisters or the handbag chipboard stickers. So I made them the focus of the page. The rest of it is pretty simple. A few strips of paper and a small cluster of puffy stickers at the top. Done. Thanks so much for stopping by my creative view today. 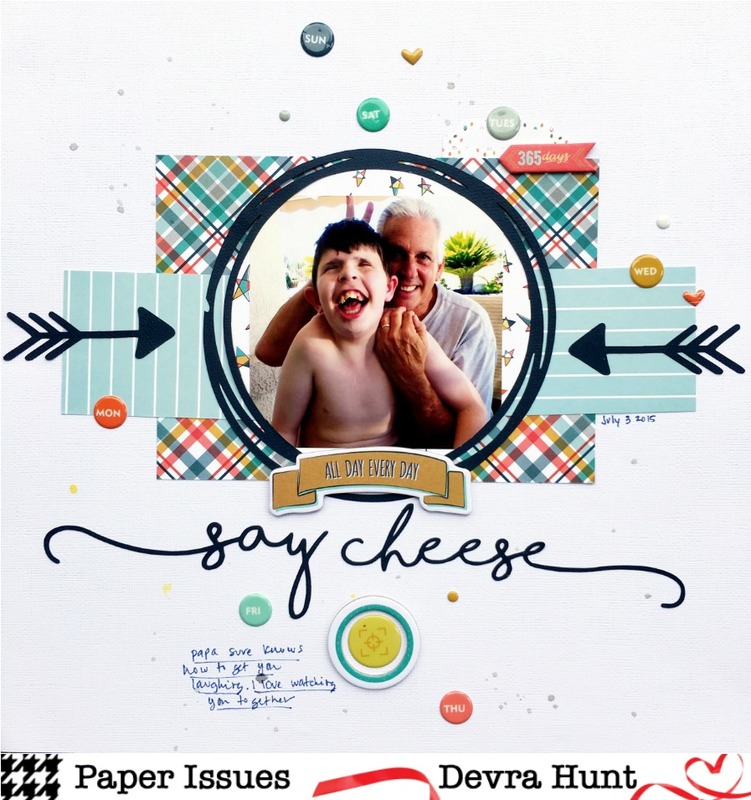 I hope you find some inspiration and join our June challenges. Remember when you shop to use my code DEVRA at checkout for 205 off your purchase!